From AFP Obama says " the lack of snow in Vancouver during the current winter Olympics and unusual snowstorms in places like Dallas in the southern United States as examples of violent weather patterns brought on by climate change." And also:"Opponents of climate change, they say -- 'see look at that, there is all this snow on the ground -- this doesn't mean anything.'" However he forgets that the much-quoted IPCC computer models have predicted the opposite of what is happening . 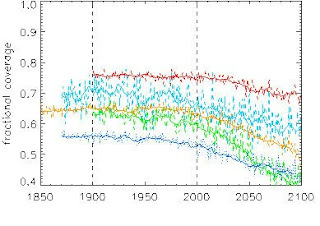 From WUWT A 2005 Columbia University study titled “WILL CLIMATE CHANGE AFFECT SNOW COVER OVER NORTH AMERICA?” ran nine climate models used by the IPCC, and all nine predicted that North American winter snow cover would decline significantly, starting in about 1990. Now it seems we are not to believe the IPCC computer model's predictions but to swallow what Obama says uncritically. 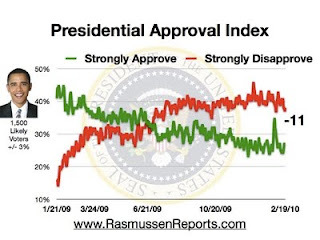 The American people are making their own judgement with their own graph and there is no hiding the decline in this one.